Turkey's state development aid agency has restored a historic mosque in Algeria known as a symbol of the country's independence. The Ketchaoua Mosque was built during Ottoman rule in the 17th century in the neighborhood of Casbah in the capital of the north African nation, Algiers. Though the mosque became a cathedral in the 19th century before once again becoming a mosque in 1962, it has retained its original grandeur. After its restoration, done by the Turkish Cooperation and Coordination Agency (TİKA) according to the original Ottoman architectural plan studied by historians and researchers, the work was greeted with acclaim. İlber Ortaylı, a prominent Turkish historian, said he was extremely pleased with the restoration. "An important contribution for Algeria, for our history," he called it. "I hope that the Hasan Pasha Palace next to the mosque will be restored the same way." İhsan Süreyya Sırma, a Turkish academic, spoke of the beauty of the lines and other elements used in the mosque's glass. Idris Bostan, another academic, said the mosque was both an Ottoman-era work and a symbol of Algerian history. "For us Algeria was the farthest corner of the Ottoman Empire," he added. Orhan Aydın, TİKA's Algeria program coordinator, explained that the restoration took a restrained approach as the mosque is listed as a UNESCO World Cultural Heritage Site. Underlining that the work was done with the approval of Algeria's Culture Ministry, Religious Affairs and Foundations Ministry, and Housing Ministry, Aydın said that architects, archeologists and engineers oversaw the project. Indicating that many foreign statesmen and researchers were present during the restoration, Aydın stated that the project was highly praised. 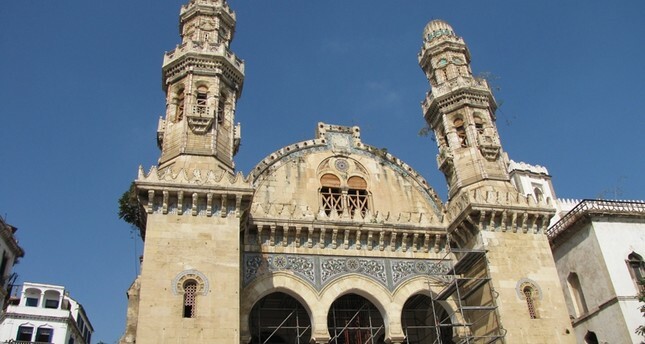 The restoration of the mosque took three years to complete. The Ketchaoua Mosque on the Mediterranean coast, an important symbol of Algeria, was first used as a military depot during the French occupation and later as a residence for the archbishops of Algeria. After the mosque's demolition in 1844, a large church was built and the building remained a cathedral until Algeria gained independence in 1962. The area in front of the mosque began to be referred to as Martyrs Square due to events concerning the French occupation. After the occupation, the mosque turned into a symbol of independence.